Kim Clinkunbroomer - I always think, what an awesome name for a PPC expert - shared on Google+ a new feature for Google AdWords MCC (My Client Center) advertisers. In short, as you get more and more clients in your MCC interface, some of those clients leave over time and leave access to their accounts. Now advertisers can hide those accounts from their interface. 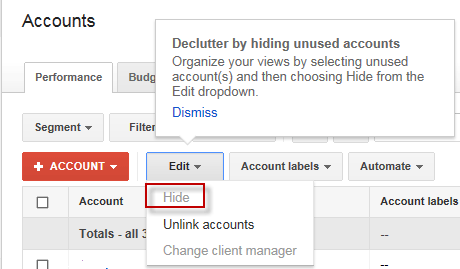 It says you can now "declutter by hiding unused accounts," "organize your views by selecting unused account(s) and then choosing Hide from the Edit dropdown." This is a small new feature but for many serious AdWords consultants, this can be a huge time saver for them. Especially ones that are OCD.